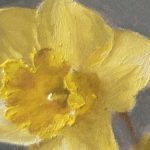 My last chance at daffodils! 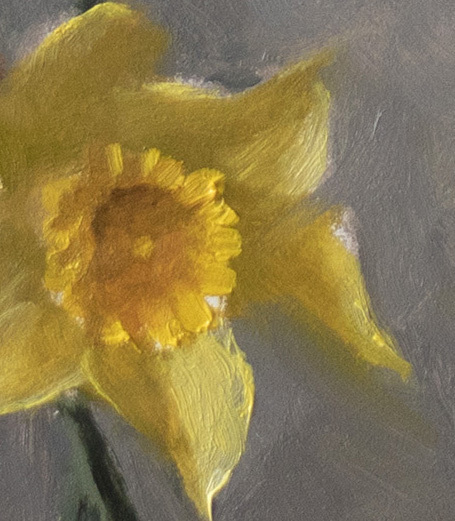 For the last few painting sessions I’ve been doing studies of daffodils. They’re fascinating to paint because of the high chroma and also the narrow value range from light to shadow. To do them well means a lot of careful control. 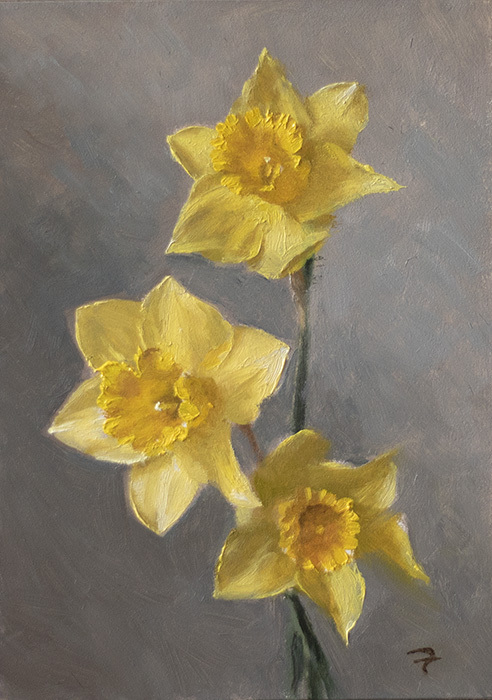 This week, I noticed that the daffs in the garden were starting to die, so I had this last chance to do a finished painting of them before spring moves on and they’re out of season. 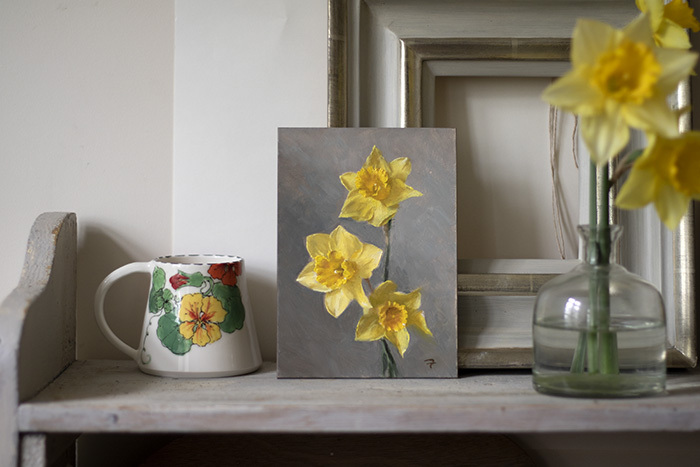 Yes, I’m sure I’ll be able to get them from florists for a while yet, but I’ve decided to try to paint as much as possible what’s growing around me in the Cotswolds this year. So my subjects will likely become a bit more seasonal! 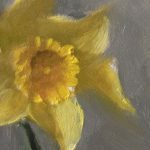 In this first video I’ve drawn out the daffs and laid in the background, I get the first flower mostly done before I have to stop to pick the kids up from school! In this second video I finish the painting. I’d already finished the flower I started the day before and painted the highest one too, so I’m really making final decisions about the overall value balance and composition and painting the final flower at the bottom. I stream live pretty often on Facebook, although I rarely schedule them. If you want to catch them as they happen, please feel free to follow me on Facebook. That’s all for this week, hope you had a great week at the easel! Next week I’m in Belfast giving a five day colour workshop so there won’t be a blog post. Stunning painting Paul, l am so looking forward to taking your colour workshop, l’ve been looking out for it and l am delighted l could get a place on it. Regards from Helen in Dublin! Thanks Helen 🙂 As I write this we’re about to meet this morning! 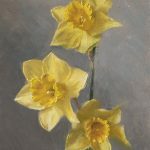 I’ve followed you for a while now and I have to say I think this picture of the daffodils is outstanding. I know you have worked very hard especially in difficult circumstances at times. It makes me want to pick up my brush again as I haven’t painted for about two years. You deserve all your success. The minute I saw the flowers they just jumped out at me. I,m sure they will go for a very good price. Well done and lots of success it couldn’t happen to a nicer man. I get the impression that this painting was done very recently. If so, how does it dry quickly enough for it to be sent off to the winning bidder so quickly? Also, if it is sold this quickly, is it varnished? Hi Martin, I leave them for a couple of weeks before sending, or a little longer if necessary. Thats enough to make sure the surface isn’t dry. I wrap them with glassine too which protects them. They will need a few months before they can be varnished though, yes, so I don’t varnish them before sending. The varnish would fuse with the paint. Thanks for the reply, Paul. I have to read up on Gamvar. My understanding was that it could be used almost as soon as the paint is dry enough to resist an indentation from a fingernail. Not positive though. Hi Paul – I really enjoy your site. I’ve looked at the Munsell color book but it is very expensive. Can you recommend one that is less costly? Hi Cheryl, you can get the Munsell student colour set (although avoid the 4th edition) which is a great place to start. But it covers a smaller area of the colour space than the big book does, so if you got along with this approach and wanted to develop it, you would probably want the big book sooner or later. It is quite an investment, but for me it’s paid for itself many times over. I’ve read about the criticisms of the 4th Edition. Have you seen the new 5th Edition? Have they addressed the problems? I’m more interested in getting the color chips versus the exercises and text, and the 4th Edition has the grayscale neutral chips that several of the earlier editions inexplicable lacked. I like your concept of only using current flowers for still-lifes this year. We don’t have much in the way of flowers locally other than fruit trees and the wildflowers along the hedgerows. The daffodils just came-up this week, though in town they’ve been up for a week now. It’s colder here in the countryside and they’re triggered by soil temperature more than the air temperature. I’m thinking of following your example of a few years ago and concentrating on values-only this painting season, starting with just monochrome oils with just a touch of color. I haven’t worked in oils in decades. Most landscapes and marinescapes seem to fail due to excessive chroma, so I thought of starting at the opposite-end with neutral grays. The local Jerry’s Artarama art supply has an intriguing 12-tube set of slightly-tinted and coordinated grays, and a 24-tube set of basic palette colors in their Soho house brand of professional grade oils paints at an affordable price. That and a large tube of White gives me a place to start. Although I had good reports initially of the 5th edition, I saw one on the workshop yesterday that had the same problem. Why they can’t sort this out is beyond me, there have been enough negative reviews and complaints about it. At the moment the best advice I can give you is to go for a used third or second edition. 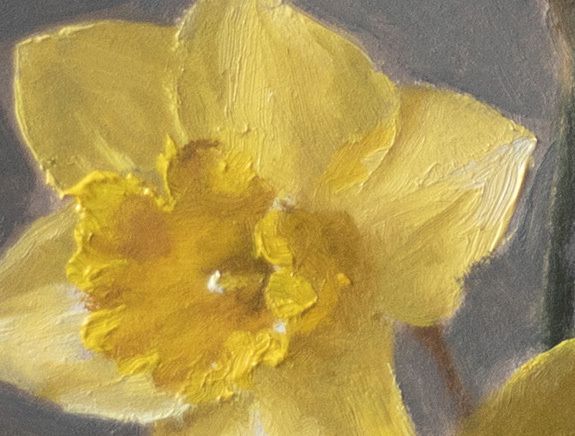 Hi Paul, I would really like to see your videos about how you painted those daffodils. But there is no link I can click on to watch them. Maybe I need to look somewhere else? Oh sorry Kerstin, they work ok for me – are you on a tablet or a phone? Paul, nice painting and video. What Munsell numbers did you use for your three light/Shadow color families? I can’t remember exactly now, but the trumpet was 5Y and the radial petals were 7.5Y I think – slightly more green. The values of the lights were up around 7 or 8 to to 9, and the shadows about 6 or 7. The values were pretty close. Hi Paul, Gorgeous daffodils!!! You really nailed them. I’m wondering how you deal with the drying time with oils and selling recently completed paintings? How long do you let them dry before varnishing? Have you covered this already in a blog post? Thank you! Oh, sorry I see that you answered that already above. 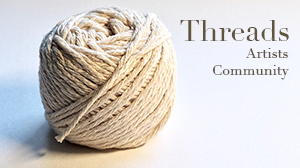 You send them unvarnished or the winning bidder has to wait a few months for them to arrive? thank you! Yes I send them unvarnished.